Capuchin friars are part of an autonomous branch of the Franciscan Order distinguished by their simple dress. Bishop Sean O'Malley has worn his habit at other posts, so he may continue to wear it in Boston. Robe: Floor-length and chestnut brown, it is associated with most Franciscans because St. Francis of Assisi wore undyed wool that eventually turned the color of his native Italian earth. Sandals: Although Francis is often depicted barefoot, he may have worn simple sandals because he always traveled by walking. Capuchins are properly called friars, not monks, because they have a public ministry and are usually not cloistered. The order�s patron, St. Francis of Assisi (1181-1226) was born to wealthy parents. As a 20-year-old prisoner of war, he began a conversion to a religious life. He embraced lepers and took the vows of obedience, poverty and chastity. In 2002, there were 10,833 professed professed Capuchins and 509 novices in 96 countries around the world. s the Capuchin friars of Roxbury gather for their morning prayer and their long days of study and service, they walk through the three-decker they have converted into a friary and look up at a painting of the San Damiano Crucifix. It is from such a cross, Franciscans believe, that God spoke to Francis of Assisi 900 years ago, instructing him to repair a broken church. Last Tuesday, just five hours after Pope John Paul II appointed him the next archbishop of Boston, Capuchin Franciscan friar Sean Patrick O'Malley looked out across the rows of reporters, directly into the television cameras, and said the time has come again to repair a broken church. The Archdiocese of Boston, reeling and wounded after 18 months of nonstop crisis, now awaits the July 30 installation of an archbishop like none this city has ever seen -- a bearded Franciscan friar who once took a vow of poverty, who wants to be called by his first name, who eschews the trappings of princely power, and whose career suggests he means it when he says his first priority is the poor. For many, the simplicity of O'Malley's habit was a striking symbol of his lack of airs, and a contrast to the last archbishop of Boston, Cardinal Bernard F. Law, who was a prince of the church in every way. The contrast is likely to be intensified at the installation, which, if O'Malley's past is any indication, will not include much of the pomp that attended the ceremony at which Law became archbishop in 1984. But O'Malley's friends and church scholars say the character of the archbishop-elect's religious order is likely to affect his tenure in far more dramatic ways -- perhaps beginning with his choice of residence, and potentially affecting how he allocates diocesan resources. According to Dr. Michael F. Collins, the president and chief executive officer of the Caritas Christi Health Care System, when O'Malley was bishop of Fall River he frequently urged the Catholic hospital there, St. Anne's, to intensify programs to serve the uninsured and others in need. The appointment of a Capuchin Franciscan friar as archbishop of Boston is unusual -- there are only about 40 religious order priests serving as bishops in the United States. 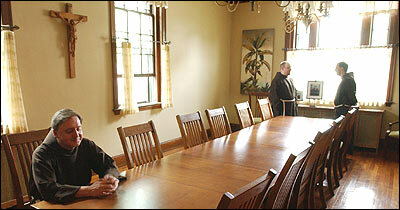 But the pope has increasingly turned to religious-order priests to serve as leaders. ''As the number of priests declines, the pool of attractive candidates is also going to decline, so instead of only looking to secular clergy for episcopal positions, you also look to religious orders,'' said Stephen J. Pope, chairman of the Boston College theology department. In the United States there are about 45,000 Catholic priests in the country -- down from 59,000 in 1965 -- of whom 15,000 are members of religious orders, according to the Center for Applied Research in the Apostolate at Georgetown University. Pope noted that, although much has been made of the theological similarity of Law and O'Malley - they are both theological conservatives who have been particularly outspoken in opposition to abortion rights -- O'Malley's decision to use the ''repair my church'' line in his opening speech suggested a significant difference in approach between the two men, and one that may be shaped by O'Malley's status as an outsider in the world of diocesan church life. The Episcopal Church in Massachusetts has also turned to a religious order priest to oversee its diocese -- Bishop M. Thomas Shaw is the only monk serving as an Episcopal bishop in the United States. Like O'Malley, Shaw's leadership began in crisis -- shortly after he was elected, his predecessor, David E. Johnson, committed suicide, and the diocese revealed that Johnson had been involved in several extramarital relationships. Religious order priests haven't been immune to scandal, and some orders have been accused of failing to take abuse allegations seriously. But some scholars suggested the Franciscans' tradition of humility might be particularly attractive now in Boston, where the church's credibility is low and leadership has been seen by many as secretive and self-protective. ''Most people would say part of the scandal was rooted in a kind of arrogance, and we're less given to arrogance,'' said Brother Jack Rathschmidt, the guardian of the San Lorenzo friary in Jamaica Plain, where Capuchins-in-training reside while completing their studies. Rathschmidt is a priest, but, like other Capuchins interviewed for this story, asked not to have the title Reverend used in front of his name. Rathschmidt noted that, in the past, Capuchin friars who have become bishops have most often done so incountries where the church isn't established enough to generate local bishops. O'Malley said at his Tuesday news conference that he had told the Vatican he thought Capuchins should serve as bishops only in such mission regions. But Rathschmidt, like others, suggested that in today's church, Boston is now ripe for missionary work. Franciscan friars are male brothers and priests who live by the rule of Francis of Assisi, a 13th Century Catholic saint who renounced possessions and embraced a life of poverty as he sought to imitate the life of Jesus. He professed love for all creatures, and is sometimes described as having preached to birds; in 1979, John Paul II declared Francis to be the patron saint of ecology. The Franciscans are best known in Boston for their administration of Saint Anthony's Shrine, also known as the Worker's Chapel, in downtown Boston, but Franciscans also administer Our Lady of Mount Carmel parish in East Boston, Our Lady Of Czestochowa in South Boston, Saint Francis of Assisi in Cambridge, Holy Trinity in Lawrence, Saint Ann's in Marlborough and Sacred Heart in Waltham. All three branches of male Franciscans, as well as the Poor Clares, who are female Franciscans, have residences in the archdiocese. The Capuchins are one of the three independent branches of male Franciscans. The Capuchin order was founded in the 16th century as a reform movement by Franciscan friars who wanted to stress the practice of contemplation and to live a stricter, more austere interpretation of the rule of St. Francis, which requires a devotion to poverty and emphasizes preaching and missionary work. Today there are about 11,000 Capuchins around the world, including about 80 bishops worldwide, two serving in the United States: O'Malley and Archbishop Charles J. Chaput of Denver. ''We have two focuses that we hold dear -- contemplation, for our constitution asks us to pray at least two hours of meditation a day, and fraternity, because we always live in a group of at least three friars,'' said Reverend Paul M. Kuppe, the provincial minister of the Capuchin Province of St. Augustine, which is the province O'Malley joined in 1958 as a high school seminarian. O'Malley's relationship with his order has changed somewhat as a result of becoming a bishop -- and he has been a bishop since 1984, first in the Virgin Islands, then in Fall River, and, since last fall, in Palm Beach. According to Kuppe, O'Malley is no longer bound by his vow of poverty, and his obedience has shifted from his religious order superior to the pope. As a friar, he would own no property; as archbishop of Boston, millions of dollars of real estate will be held in his name. And he may, unless he eschews it, live in the Italianate manse in Brighton that has been home to his predecessors for much of the last century. This story ran on page A1 of the Boston Globe on 7/6/2003.